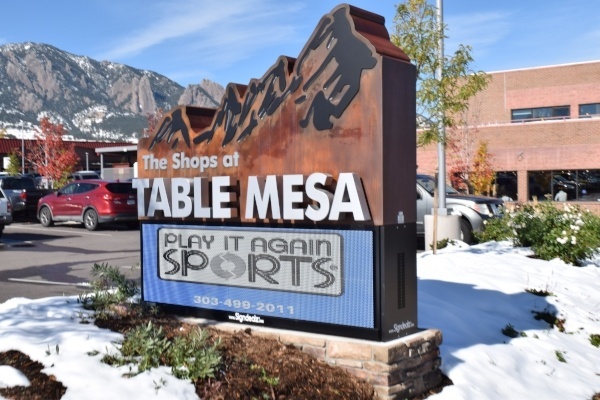 WW Reynolds contracted with Signdealz to develop a new LED multi tenant sign for the Shops at Table Mesa. WW Reynolds is a commercial property management and development firm in Boulder Colorado and currently owns, manages and / or leases over 3 million square feet of commercial office, retail and industrial property along the Colorado front range. Signdealz worked with our client to develop an effective LED solution using a Watchfire 10MM LED display. This display technology allowed us to provide advertising using a small format display that has the best possible resolution for both pedestrian and vehicle traffic. This sign has proven benefits for the tenants of The Shops At Table Mesa by allowing them to promote their businesses, special sales offers and provide direct communication to the public. Curious to find out how an LED display can benefit your business?